SQL Server gives you Fuzzy Lookups and Fuzzy Grouping, but only in SQL Server Integration Services. It’s not even on the list of SSIS enhancements for SQL Server 2008. Please check it out and provide comments, votes, validations. All this will help persuade Microsoft to implement this useful feature. And tell your friends too! The more it receives, the more likely it will be implemented. I’m at the MVP Summit this week – an event at which Microsoft communicates (talking and listening) with MVPs. I’m having a great time. I’m seeing people I haven’t seen in ages – Aussies I rarely see (like Nick Randolph), former Aussies (like Chuck Sterling), people I talk to regularly on IM (like Simon Sabin), and people I see almost never (like Dejan Sarka). I’m also meeting a lot of people I’ve never met before, like Allen White, Tony Rogerson and Desmond Tutu and the Dalai Lama. 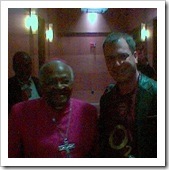 Oh, alright, I didn’t really meet the Dalai Lama (he walked past, but we didn’t talk), but I did meet Archbishop Desmond Tutu. He was in the hotel lift this morning as I was on my way down to breakfast. He said he’s an Arsenal fan and was very sad that we lost to Liverpool recently. I got a photo on my phone, and the quality isn’t great – but I guess it’s a nice memento. From a technology perspective, the excitement is building around various new products. Summit is always good that way, but I can’t write more for NDA reasons.